SHELTERS OF HOPE renovates Bomb Shelters in Israel and is led by an Israeli believer. AMC is calling upon our member congregations to join together to fund this project in 2011. As the turmoil in the Middle-East increases, those of us with connections to Eretz Israel keep an ear open and beseech the God of Israel for her safety. Reports indicate that Hezbollah now has many longer range rocket launchers in Lebanon that can strike almost anywhere in Israel. For many of us this is a real danger. Our own Messianic Congregation has seen 2 of our families make Aliyah to Israel in the last 3 years. Regarding this, I believe that God has opened up an opportunity for us, as Messianic believers, to show the people of Israel the love of Messiah in a meaningful and tangible way while, at the same time, opening up doors to share the good news of Yeshua with them! Several years ago, one of our Israeli Jewish brothers in the Lord, Rony Jordan, and his wife, Cindy, were given a vision to go back to Israel and refurbish existing bomb shelters (many of which are in terrible condition, some completely unusable) without cost to the residents. The goal is to earn the right – through relationship – to share the good news of Yeshua with the Israeli people. The money to pay for this work has, so far, come from churches who wish to demonstrate their love for Israel. To date, they have paid for almost a dozen bomb shelters (see www.sheltersofhope.org). Recently, the Ben David Messianic Jewish congregation in Orange, California (www.BenDavidMJC.org), became the first Messianic congregation to fund one, as reported in the Messianic Times. We are proposing that AMC congregations join together to fund one. 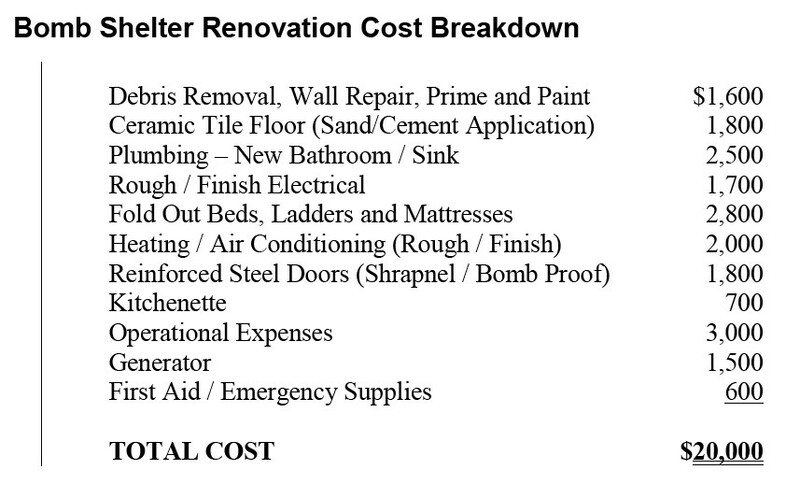 The cost to cover a single refurbishment is now about $20,000. Instead of asking any individual congregation to bear this burden alone, we would like to have 10 AMC congregations band together and split the cost (only $2,000 per congregation) and thus become the first Messianic organization in the world to fund a bomb shelter refurbishment for the Israeli people. We're also inviting individuals to partner with us to fund this important project. SHELTERS OF HOPE is a USA 501c-3 organization, registered in California.